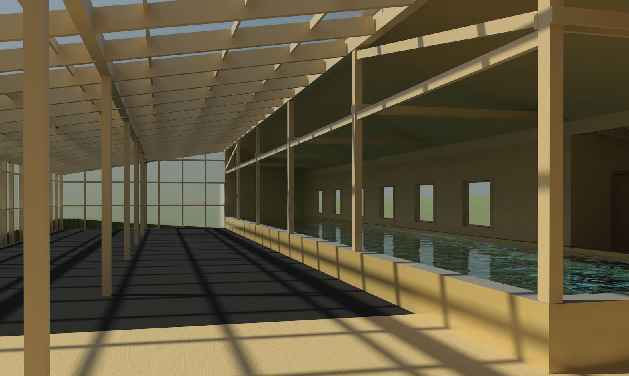 Here are some pictures our architect/engineer prepared for us for our greenhouse/pool we are building in 2011. Unfortunately the images didn't look so good when shrunk and in full size they are often larger than most people's monitors, so looking at them with all the detail entails scrolling back and forth a lot. We plan on updating this site with pictures as we break ground (beginning of April is our goal), hopefully we will remember to take lots of pictures. Getting Started on the excavation. One weekend we discovered a muddy pit. A brief update in July. Finally, an update! Spring of 2012. Note: includes videos! March 2013 update, also a couple of videos. May 2013 update, walls, windows, doors and greenhouse roof! April 2014 update, equipment room, bathrooms, electric, lots of 'exhausting' work and the pavilion. NOTE: contains updated satellite imagery showing the greenhouse from above. Here are pool details for those interested.